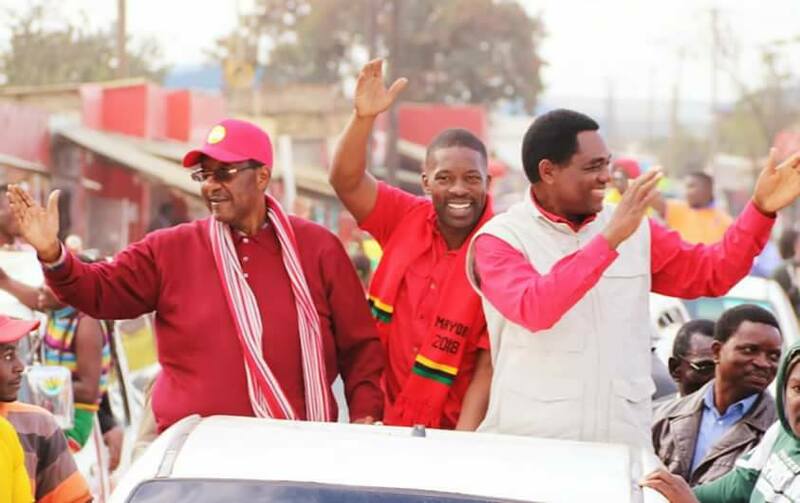 UPND leader, Hakainde Hichilema, party vice president, Geoffrey Bwalya Mwamba (GBM) and Mayoral aspiring candidate in the forthcoming Mayoral elections slated for July 26th, 2018, Chileshe Kangwa were this afternoon received to a thunderous welcome by the people of Kanyama. The road show, the party’s third in Lusaka, started at Kanyama’s Hotel, where GBM had earlier addressed his supporters around 13:00 hours. From the hotel, the entourage, then led by Dr Mwamba, Mayoral candidate, Chileshe Kangwa and campaign manager for the election, Sylvia Masebo headed for Garden House via Mumbwa road. At Garden House market, Chileshe Kangwa made a stop over and greeted marketeers and businessmen, explaining to them his vision of a better city. “We will ensure that you marketeers, SME’s access some business boost through loans. We will ensure that you have a conducive trading place, habitable and clean. We will also ensure that you trade freely, without intimidation from cadres. And, through the little levies you will be paying to the Council, we will be able to build you ultramodern markets so that you could conduct your businesses effectively,” Chileshe Kangwa said. And thousands of residents of the compound, which has about 130, 000 registered voters according to the 2016 ECZ Voters Register, sang in jubilation as the trio wade their way through endless crowds of people. After making a short stop and tour of Kanyama West Clinic, GBM assured the staff, patients there that a better life for the City lay in their decision come 26th July. “Mwamumona uyu? Uyu, e Mayor wenu! Ngamwamuvotela, ninshi amachushi yapwa! Translated, have you seen this man? He is your Mayor (in waiting). If you vote for him, your suffering (markets, stations) will come to an end,” Dr Mwamba said. When the party left Kanyama West Clinic, heading for Mbasela, news got to the cloud that President Hichilema was joining the entourage, news that drove the cloud into a frenzy and great excitement. 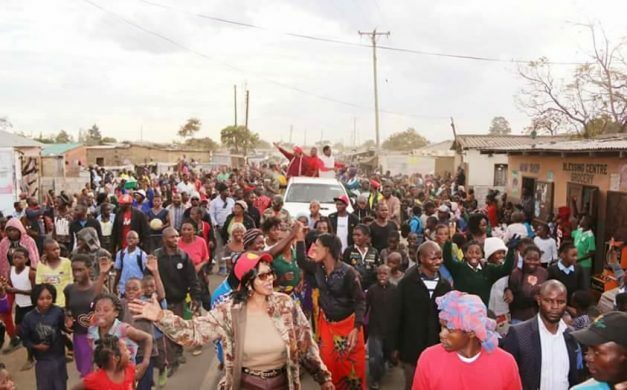 Leaving Mbasela, Masebo led the team through Mutanda Bantu market (probably the heart of the compound), where, just like earlier, the women at the market expressed joy and gratitude to the UPND leadership and urged them to soldier on and fight for them to make the city a dignified one. “We love you HH! We love you GBM! We love you Mayor na Lesa! (Chileshe Kangwa). And we are going to vote for you come 26th July! HH, please forgive us for making the mistake we made in 2016. This time we will do the right thing,” was all that could be heard from the huge cloud as they joyously followed the entourage to Bus Stop (a market at the center of the compound). The entourage afterwards headed for John Laing school ground where the two leaders addressed hundreds of supporters there who had been waiting for them for hours. “If you vote for me, I will ensure that we put up proper drainages so that our city won’t be flooded. I will ensure that you people have access to clean and safe drinking water. I will achieve that through working with the Lusaka Water and Sewerage Company (LWSC) to make water cheaper for you. I will ensure that politics is taken out of the operations of the Lusaka City Council (LCC), bus stations and markets so that the Council can have the much needed revenue and finances for the provision of quality services and the creation of jobs for the youths. ” We will introduce recycling of garbage so that we can generate revenue for the operations, repair of broken street lights, dilapidated markets; we will also provide free public toilets so that you are not inconvenienced when going about your daily business wherever you are. We will work hand-in-hand with Ministries such as Health and Local Government to ensure you have access to quality health, housing and accommodation. We will also curtail the illegal allocation of plots in order to curb the illegal demolition of structures, ” Chileshe Kangwa said, much to the chagrin of the anticipative crowd. 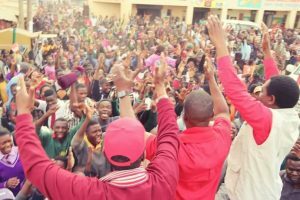 And Mr Hichilema and Dr Geoffrey Mwamba appealed to the residents to make the right choice on 26th and vote Chileshe Kangwa so that the problems facing the compound in particular and the city in general could be solved. “Turn out in large numbers and vote for Chileshe Kangwa. You should also make sure you protect the vote. Don’t allow them to steal the vote,” Hichilema said. “If you make a mistake in this election, you will suffer. This PF will make you go through a lot of problems, more than you are going through right now. So, make sure you vote for this man. If you make a mistake, don’t blame us,” Dr Mwamba told the cloud. That is being stupid where do you want the candidate go to lobby for votes? PF disease Indeed! No private toilets, Chileshe is going to build them. IF this Mayor wins,he will not last long in his position when UPND sees that he closely works with PF Ministers and Councillors as he is planning.The official UPND position is that no UPND MP or Councillor should be seen to cooperate with PF Ministers or other Officials.In Southern Province,NO UPND MP or Councillor attends a meeting addressed by the Republican President when he tours and inspects projects in that province. AFTER LOSING A RECORD FIVE TIMES, HH HAS DEFINITELY BECOME A TOURIST ATTRACTION FOR MANY ZAMBIANS. EVEN ME I WOULD NOT HESITATE TO HAVE A GLIMPSE OF SUCH A LOSER…AND EVEN TAKE A SELFIE WITH HIM ACTUALLY.